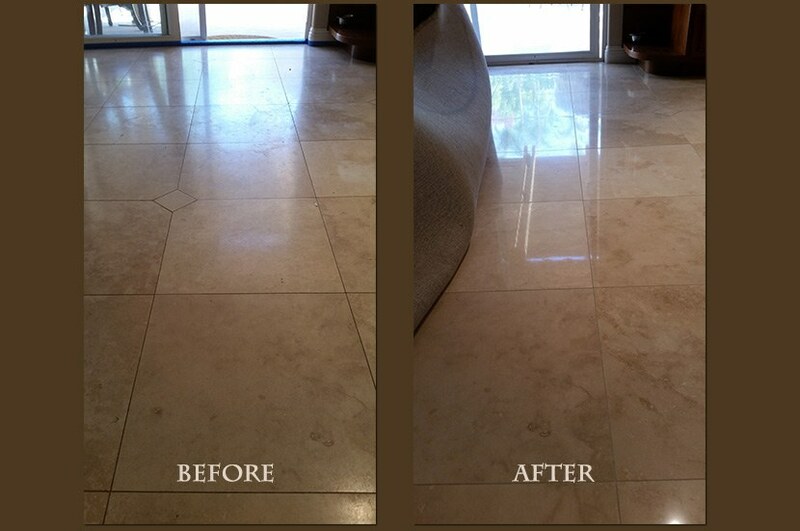 For 11 years, this honed finish travertine floor had never been professionally cleaned. This floor was not stained, scratched, etched, chipped, or damaged, but it did need a good cleaning and some minor restoration, as you can see in the BEFORE image. Our restoration process was rather simple. First, we honed the stone to remove minor imperfections and cleaned the grout lines. Next we polished the floor a little bit. 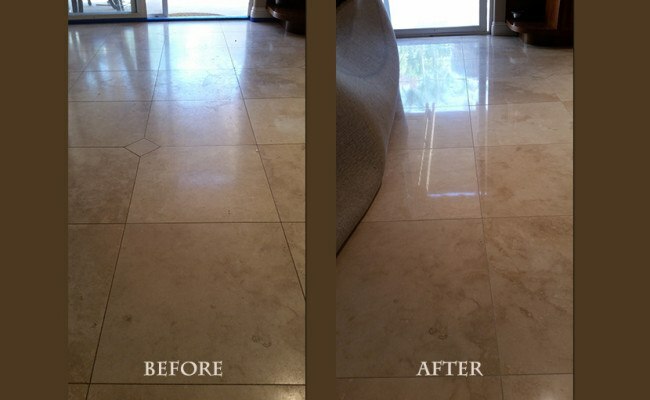 Lightly polishing travertine that has a honed finish adjusts the level of sheen. This is all the floor really needed, and we were able to give the floor a hint of shine, just like our customer wanted. The AFTER image demonstrates the clean, beautiful results. For more information about travertine restoration, such as etch removal, lippage removal (leveling uneven tiles), crack and chip repair, stain removal, sealing, filling naturally-occurring travertine holes, as well as honed, slightly polished, or high-gloss polished finish, watch one or more of these short videos: Floating Travertine, Travertine Strip, Hone, and Repolish, and Travertine Repair, Restoration, and Polishing. Perhaps your travertine floors need to be cleaned and honed. Highly qualified professional technicians can provide these services for you and can even change the finish from honed to a high-gloss polished finish. Perhaps you need more than just a new finish. Professional stone restoration services can resolve other travertine problems, including etch removal, lippage removal (leveling uneven tiles), crack and chip repair, stain removal, sealing, and filling holes. If live in the San Diego area and you need marble floor polishing, travertine floor honing, or any other natural stone repair, restoration, or maintenance, contact us online or call 619-246-0240 today.